Hi all. I'm currently in Maryland working on an unnannounced game so it'll be at least 2 weeks before I can look at GalCiv II again. Hey Frogboy. Thanks for letting us know and good luck in Maryland. 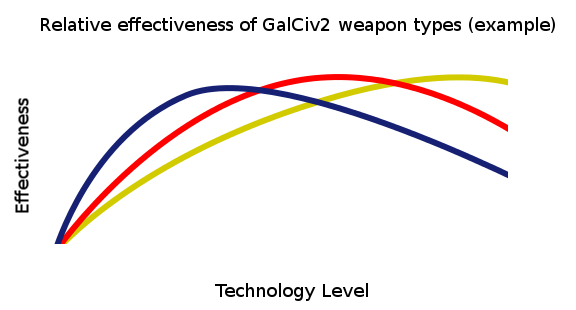 Bear in mind, we can always do more updates to GalCiv II. so where is this modified exe so I can play the CU? and yeah I'm very late to the party. You can download it from the file archive. You can find the link in the original post. It's good that we get additional time, in the meanwhile we might be able to sort out some stuff were we didn't take a look before. Later I aim to see through the changes in game, if someone finds something off please let me know. I'll plug those into my weapons spreadsheet (which calculates cost/power, power/size, and some other scores) and run some battle simulations. Should be interesting. Ok, I see now why Harpoon + Photonic Torpedo have their costs reduced: The size of these weapons become only smaller by -1, whereas other weapons get -2 from tech to tech. So, in order to justify Harpoon2/3 & Photonic Torp.2/3 these weapons gain less cost as an extra. However, these reduced costs should also translate into less costs ingame, but that might not always be the case. 4*Harpoon1 = Att+12 for 344 bcs w/ 4 spaces left. 4*Harpoon2 = Att+12 for 328 bcs w/ 8 spaces left. We get 346 bcs for the Harpoon1 ship and 332 bcs for Harpoon2. However, the Harpoon2 ship actually has enough space left so that a defense mod could take place. Using Duranthium III = 343 bcs, I still am not able to get a more expensive ship, although it is superior. Stockraces also don't do reliable research into defenses, so this is not even a favourable scenario. The costs of the weapons inside a Tier should normally rise a little bit, for example, Laser1 -6 MP, Laser2 -3 MP, Laser3 stays. We could then leave Harpoon & Photonic Torp. at equal costs an thus, totally eliminate all downgrade issues. @10 Minia I can put 4*Laser3 on a small hull for Att+4, costs 160 MP, 2 spaces left. @10 Minia I put 3*Laser3 + 1*Laser2 on small hull for Att+4, costs 157MP, 0 space left. Yeah, that's ugly. There is a nice solution, which is making Harpoons cost 62 (all levels) and Photonics cost 60 (all levels). I'm not at all concerned about cost/power being "smooth" within a given weapons tier; its the tier-tier jumps that I look at. Also, the Psionic Beam should be size 7, not 6. Both other Psi weapons get a little over 2x the power/size ratio of the level 3 weapon in the tier that opens them up. Psionic Beam is around 3x, this is too much. I haven't finished my analysis by a long shot but I'm pleasantly surprised so far. Tier by tier weapon comparison, using the values provided by Maiden's GC2Types.xml, using Mass Drivers as nominal cost/power and nominal power/size. Battles were simulated using $100k bc worth of ships in fleets, throwing fresh fleets against fresh fleets, then injured, until one side was dead. The simulation is run several times for each weapon combination, hull size, and tier. Note that I consider the simulation "close" if the winner has <10% of their original ships remaining, a solid win from 10-25%, a decisive win from 25-40%, and anything over that is crushing. Beams are 50% more expensive and have 25% more power/size. Missiles are 32% more expensive and have 53% more power/size. Small hull, no mini: Beams beat missiles. Drivers win decisively against both. Medium hull, no mini: Missiles and drivers about equal. Each win solidly against beams. Missiles are 37% more expensive and have 36% more power/size. Small & Medium hulls, no mini: Missiles beat beams. Drivers win decisively against both. Large hulls: Missiles beat beams. Drivers beat beams decisively and missiles solidly. Beams are 24% more expensive and have 28% more power/size. Drivers have solid wins on all hull sizes. Beams and missiles close on small and medium hulls, Missiles beat beams solidly on large and huge. Drivers have solid wins on all hull sizes. Beams and missiles close on small hulls, Missiles beat beams solidly on medium or bigger. Drivers have decisive and occasionally crushing wins on all hull sizes. Missiles beat beams on all hull sizes. Drivers win decisively on all hull sizes. Missiles beat beams on all hull sizes, but its close. * Mass Drivers are too good (or cheap, take your pick). They allow you to get a lot of metal in the air, and even though pound for pound they don't do as much damage as beams or missiles, there's enough HP left to carry the day, quite decisively most of the time. * Beams and missiles are close. Missiles have the edge, but they're more expensive to research and have the lowest utility due to their size. * due to how sizeMod works (constant + to weapon size regardless of initial size), beams get heavily penalized on larger ships. This really hurts them. * I haven't taken defenses into account. That's an order of magnitude harder to code. * I owe OShee an apology for accusing him of underestimating the value of per-fleet attack. I overestimated it at least as badly. There is a nice solution, which is making Harpoons cost 62 (all levels) and Photonics cost 60 (all levels). All Drivers saw an increase to their cost by 10%. I bared T0 & T1 though, and Psionic Shredder. Were the evil-weapons tested? Silas, I have no idea if that will suffice, all we (you ) could do is yet another simu. Maybe just a small excerpt to see if it's better. 1) Hitpoint mods, esp. in the early game, they justify far more on strong/expensive ships. 2) Additional HP from experience gain. Stronger ships usually survive more although this requires a time in which repair could take place. The problem here is to avoid a balancing where Beams and Missiles are/do/give you the same just having another name attached to it. Any ideas how to do that? Maybe we could make Beams stronger on tiny/small craft and make Missiles strong on large/huge hulls, and both equal on medium hulls. In a way it is already like this, but the problem here is that tiny/small hulls are just trash once medium gets available so Beams practically loose their design advantage from mid-endgame, and that's unacceptable. --> Missiles are strong, increase their RP. Kin Str III cost to 37 (-5) because the change in size from 4-->3 would be too much. Decreased size of all Particle Beams by -1. I've tried to decrease their costs but because Laser/KinStr are so expensive that would have automatically resulted in "negative cost shipupgrades"
Decreased size of Phasors by -1, but increased their size mods by +1. Also slightly adjusted their costs inversely to their size because going from size 6-->5 is stronger than going from 8-->7. Costs of Phasors I -6, Phasors II -3. Increased size mod of all Drivers by +1. Decreased size of all Disruptors by -1, increased cost of Disr II by +2 & Disr III by +4. Increased size mod of BHG by +1. Decreased cost of DoomRay by -15 but increased its size mod by +1. First, small tech description issue: The technology name is (i belive) Black Hole Gun but the actual weapon is Black Hole Generator (an obvious infringement on Master of Orion territory.) Recommend changing the names so that they match. Okay, my thoughts on weapon modding -- Here are some options that could be explored. 1) [Current approach] Basically keep everything even between different weapon types of the same Tier throughout the game. This way, players can decide between getting something working immediately, or investing in quality. An UN-balanced approach like this will also contribute towards breaking stalemates. @Maiden: I appreciate the tweaking, but if there's call for it I'm just going to work on the whole thing from scratch until the simulator numbers look good. I've automated quite a bit of it, in that I just have to feed it the relevant numbers for a tier and I get a nice summary across all hull sizes and weapon matchups. It'll probably take me a while to get the numbers working right; not only do they have to produce the desired sim. outcomes they also need to improve tier to tier in a meaningful way. Eep. Just for yucks, I think I'll also test the CU 5.7.1 values. Sound pretty good imo. Picking a weapons is picking akin to picking in which era is optimal for you to go to war. It puts pressure on the player to make a meaning full choice and stick with it or face the consequences. My 2c on the weapons issue. The existence of a significant difference in the "bang for the buck" between weapon systems is not necessarily a bad thing, unless the difference are so great that there is no point at all in building them. What would that point be? When building the more efficient systems create more damage even against the best defense than the less efficient system does against no defensive structure. Then one would never build the weaker weapon system. Somewhere north of this is an area where the ideal mix of weapon systems given the optimum defense will be a mix --- which could be calculated using game theory, but probably no one is going to bother with that . Ideal numbers will not be necessary, just a rough notion of how much of each make sense. Of course a huge factor in all this is what the AI will research and build for weapon and defensive systems. If the AI prioritizes defenses against the most efficient weapon, then building less efficient systems becomes indicated. My point is that "bang for the buck" in principle should be determined over a complex mix of criteria, not just cost per part per size, for example. Allowing significant differences in some areas can add some "color" to the game (others may differ!). I like the idea of weapon efficiency peaking at different times, because then everything is in play. One can't just ignore a given line of research without facing a serious catch up problem later. But I wonder how to implement this considering the huge difference between galaxy sizes and research rates that can be chosen. Others may be able to address this. Actually, 2 is already our current approach. Silas' sims help to understand how well they do like in game where you have to invest production to get these ships. An early military advantage weighs far more heavy than a late. In your example all empires that would pick the yellow weapon will most likely be defeated before they would see their weapon-advantage arise. Dependant on the setting/technological speed, it might even be the case for the red weapons. In my games I rarely research past Tier3, because the outcome of the game is already set. But even if blue isn't able to end the game in time its early advantages might be enough to place them into a situation (lots of systems annexed) where they are able to continue to defeat even superior weapons just by quantity/shipspam alone. What could be done is to alternate research costs for specific weapon techs, at a racial level. Thus, the weapon progression will be different from race to race, some might advance faster in one tier of a branch but be stiffled in another etc. For a player it will be very difficult to spot these weak/strong traits. Another method would be to disallow creativity occasionally, or to introduce additional techs in a tier (like vanilla), but I hope that OShee is going to return by tomorrow evening and voice an opinion/proposal here. Another trait (that is already in place) is that tier1 introduces multiple (racial) weapons that are unbalanced but these actually incorporate a huge randomness into how the game develops militarily. When I look into the vanilla tree this concept was also occasionaly in place in mid and lategame weapons. But I wonder how to implement this considering the huge difference between galaxy sizes and research rates that can be chosen. Others may be able to address this. I'm afraid this is impossible to do. Although the games manual explicitly explains that the techspeed setting is of serious importance (it is the only setting where such a remark is made...) the setting is still at total liberty in the hands of the player. I remember someone playing very fast speed under a gigantic all-abundant setting. At that, one could research tier1 + tier2 in a single turn (just wait until the colonial rush is over) and this setting would practically reduce the early-weapon advantage to 0 and the midgame to something very low. Somewhere north of this is an area where the ideal mix of weapon systems given the optimum defense will be a mix --- which could be calculated using game theory, but probably no one is going to bother with that. We first need to finish weapons before we can take up defenses. I have no idea if research into defenses (or shipdesign for that matter) is reflected on the weapon-type of neighbours/war-enemies or simply random or selected by sheer number strength of what's available, but this are really good questions that should be solved beforeahead. However, we have different strength in raw attack of each weapon branch and the defenses have to reflect this as well, otherwise PD and Shields will be relatively weak against their ontype weapons and armour strong. Tier 2: Drivers dominate. missiles are so-so and not much improvement over T1. Tier 3: Beams rock! Drivers not much improvement, missiles lag. Tier 4: Missiles make a huge comeback. Beams are so-so. Drivers lag. 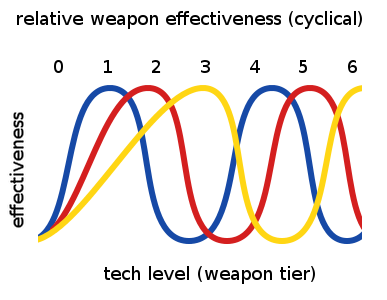 I also usually "end" the game by T3/4, so having cyclical peak eras for weapon types would get all three types cycled by the time the game "ends". This would definitely create some interesting situations in the galaxy. T1 supremacy does not necessarily mean an immediate advantage for the race that choose that type. I generally try to turtle until T2 or T3 and then come out big. Yarlen and I had a brief exchange and due to circumstances there's a few weeks left to tinker with the CU. I proposed implementing weapon/defense changes you guys have been working on provided they are fleshed out and properly tested. If it's unanimously agreed upon the update is finished I'll integrate it into CU V5.7.1 and update the change logs. If not, we'll ship CU 5.7.1 and the weapon/defense enhancement can be released as a modification at a later date. I can't play a part in the design of the new weapon/defense system other than providing administrative duties and hosting the file archive. My job is hectic and is about to get frenzied. So I'll be working on a new manual when I can (which isn't often). I do believe I can finish it in time for release though. Please add altered files to the existing file archive so people can find them easily. PM me your dropbox info and I'll share the folder for easy access. One thing. Don't bother yourself updating the change logs. I use a tool which detects changes in the XML files provided the entries are kept in the same order. All I have to do is copy a new file over an old one and this tool (Tortoise SVN) will tell me exactly which values were altered. This makes updating the change logs a breeze and will free up time for you guys to work on designing the new system. Good luck. Have fun. I look forward to testing the new weapon/defense system! Cyclical is impossible to do in a meaningful fashion without massively expanding the power/cost and power/size ranges we have right now. Which means rebalancing/scaling hull HP. Which might mean reworking repair... not sure I want to go there. Trust me, it was hard enough to get 6 weapon tiers done with similar power/cost and power/size ranges to what is in the "base" CU. Each weapon type progresses from tier to tier in meaningful ways, both in cost/power and power/size, but the overall arcs have different speeds and starting points.. it was not an easy challenge. If "most" games end before Tier 4, maybe we need to look at weapon research costs. Against a "better" weapon, how much more do you have to spend on fleet tonnage to make things "even"? I'll try to answer that question, too. It might be a better metric than "how much is left over after the battle". Also note, I don't want to make any weapon OP for any given tier -- that's no fun. But I *do* like having them unbalanced across the various tiers. Once again, I tip my hat to OShee for raising this issue earlier (unfortunately, his insight was lost on me at the time). There are no - zero - reasons to use beams in the current incarnation of the CU. In fact, racial specials aside, you should never use anything except Mass Drivers, unless you're going for a tier1 rush, in which case Missiles are better if you can afford the extra research. Same here. I usually play on Large / Huge. Once i get up to the Evil weapons, the game is usually in the bag or i've lost long before that. I'm starting to like this idea compared to others modding solutions because it nullifies the question "which weapon is best overall?" or even "What's the difference between any of them?" Now a player must ask, "Which weapon is best RIGHT NOW?" Weapon eras make stealing or trading for weapons in a different series meaningful. Players must plan ahead to have the right weapon at the right time. This increases the level of actual strategy in this strategy game. It causes some chaos/imbalance among empires which makes the game a bit more interesting. Alright.. so I reconsidered my earlier "impossible". It's only "really hard". I can actually do 5 eras with meaningful, albeit wonky, progression throughout the tiers. You get two tiers of ho-hum improvement (but worthwhile nevertheless), then BAM -- the next tier races ahead of the other two weapon types. Call it a breakthrough -- and if we do this we should REALLY reflect it in the tech descriptions to make it obvious that the new weapon type is, in fact, revolutionary. The problem is one of scale. In order to have meaningful differences between weapon tiers as well as weapon types within a tier, a certain ratio of difference is needed. I don't want to push the low end OR the high end of what we're used to, in terms of weapon costs, power, and sizes, unless I really have to. I'll keep working on it. Maybe with a tiny bit of expansion at both low and high ends I can fit 6 in. I actually do kind of like it better. Any other comments about single cycle (each weapon shines in early, mid, or late game) vs double cycle (as I've described in this post) would be quite welcome at this point. I'm leaning towards double cycle, if I can manage it. Double-cycle would have the most benefit. With single cycle, i would probably totally ignore missiles. My games are never that long. Stupid AIs that go for missiles would be sitting ducks. A hybrid solution would be: tiers 0-3 would be very turbulent, then even out after T4. I'm not the one doing the modding, so i don't know, but what would happen if we simply doubled all of the stats? That would get us away from low-integer problems but would probably be a lot of work and regression testing. I also agree with having to update the descriptions. It needs to be obvious that "these beams are a game changer" compared to other weapons.